How to remove the Mercedes Star? I just got back from the Mercedes dealer to see how to remove the Mercedes Star on the grill of a 2016 Sprinter as I want to paint it Black. My 4x4 Sprinter is on the water on its way and I am trying to figure it out before it gets here. Anyone know how to remove the Star on the grille and also the one on the rear door. Not sure if this is the same model though. This Video does not show how to remove the Chrome Mercedes Star logo. How do you remove just the chrome Star from the grille? According to what Ive read the grill emblem "snaps" into place . The emblem appears to be held in place by five locking tabs. Usually the only tools required are a couple small flat blade screwdrivers to depress the tabs while applying a little pressure to the emblem to release . Rear star is easy, just use the proper torx bit with the rear doors open. You'll see it when you get the van. I used spray primer and a rust oleum spray Bedliner for the rear. Masked off the back of the assembly and primed and painted. Easy and has held up well. I attempted to plastidip the front, no luck. I attempted to remove the grill, no luck, all the clips felt like they were going to break. So I have the ugly plastic chrome star still on the van. 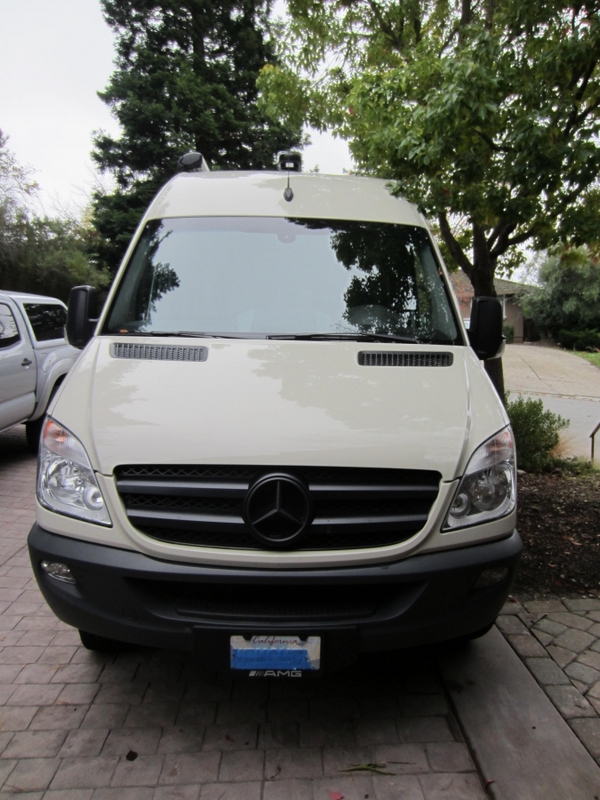 I removed all the plastic "sprinter" "2500" and bluetec emblems off the van, so all that's left is the front star. If I had a new van coming to the dealer, I'd require them to remove the front star before delivery. I'd drive the van home, paint the star, and pop it back in. You may be better at disassembling plastic auto trim clips than I am. Speaking from experience you have to be careful when removing the star since the tabs can get damaged. I did mine by scuffing thoroughly and using a bed liner spray. About 10,000 miles later and looks like new.